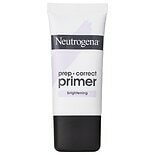 Shop Neutrogena Prep + Correct Brightening Primer (1.05 oz. )1.05 oz. Shop Neutrogena Prep + Correct Primer For Redness (1.05 oz. )1.05 oz. Why Use a Foundation Primer? Foundation can help you to create a canvas for your makeup. However, you may find that using foundation directly on your skin highlights some of the imperfections that you would prefer to conceal. Liquid foundation can sink into fine lines and wrinkles, making them more pronounced. Some foundations can emphasize your pores as well. By using a foundation primer, you can minimize any imperfections, helping your complexion to appear smoother and more even. Foundation primer can also help your foundation last longer and perform better. Consider adding a foundation primer to your beauty routine. How Do You Use a Foundation Primer? Foundation primer is applied to clean, dry skin prior to smoothing on your foundation. The majority of foundation primers resemble light face lotions. A dime-sized amount of product is usually sufficient to cover the complexion. Foundation primers dry quickly, usually within three to five minutes, and do not feel greasy to the touch. They create an invisible, protective layer over the skin, ensuring that your foundation does not sink into your pores. Foundation primers help to fill in fine lines and wrinkles, creating a smooth base on which you can apply your foundation. When you smooth foundation primer over your skin you create an invisible seal over the pores. This seal has a dual benefit. Firstly, it helps to minimize pores, ensuring that they are not visible when you apply your foundation. It also prevents foundation and other makeup sinking into your pores and making them look even more noticeable. While foundation primers cannot turn back the clock, they can help to give the appearance of younger, fresher skin. By filling the fine lines and wrinkles that are associated with aging skin, foundation primers contribute to smoother skin. Some foundation primers contain light-diffusing particles that help to soften your complexion and give it a more youthful appearance. The light-diffusing particles help to minimize shadows, particularly around the eyes, that can make your complexion appear prematurely aged. If your skin is reactive and prone to redness, you could benefit from a foundation primer that is designed to balance your skin tone. These foundation primers often contain green-toned, color-correcting pigments that reduce redness. By correcting the color of your skin tone, these foundation primers help your foundation to produce a healthy glow. If your skin is oily, you may find that your foundation slides off over the course of the day due to the excess sebum produced by your pores. Oil-control foundation primer helps to absorb excess oil. By absorbing the unwanted sebum, oil-control foundation primer provides a matte finish for your makeup and helps to prolong the life of your foundation. Within some foundation primers you will find nourishing ingredients that boost the condition of your complexion. Nutrients, such as vitamins A, C, and E help to repair your skin and protect it from environmental damage. Hydrating ingredients, such as glycerin and hyaluronic acid, boost moisture levels to keep skin looking fresh and youthful.